Just as kids huddle around a Christmas tree, so too do air travelers gather en masse around the magical electricity poles the airlines provide in their boarding lounges. But there’s nothing worse than getting to the gate and seeing your flight is delayed, your laptop is at 5%, and some guy with everything but a Ronco food dehydrator plugged into one power terminal. Is he being inconsiderate? Rude? Immoral?!?! Who knows. Since the magic power trees/charging stations are so new, the social decorum has yet to be established. Until now, that is. We've come up with 14 simple rules to ensure that we all get to our destination with enough juice left in our phones to text Mom that we've arrived. This is true for seats and outlets. It doesn’t matter if you’ve got an urgent email to send about last night’s episode of The Bachelor. If the plugs are taken, go find an empty gate. Because this is the most crowded part of any airport that doesn’t involve security pat-downs, don’t clutter the surrounding area with your giant carry-ons and “personal items” filled with 10 days worth of clothes. Bags go under the counter or your chair/stool. 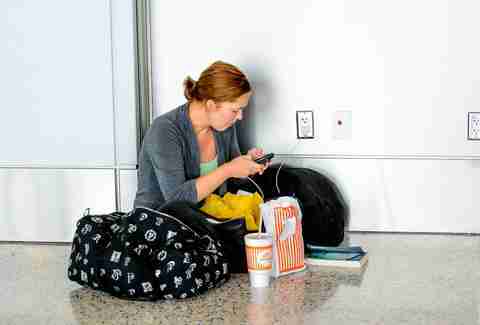 We can’t make this joke in the airport, but seriously how does anyone know it’s not a bomb? No need to get the whole airport evacuated because you want Cinnabon. If you've got a seat right in front of a plug, use THAT plug. And if you're seated in front of two plugs, leave some room for someone to access the other one. Unless, of course, you like people who've just spend 14 hours on an airplane and haven't showered leaning over you to plug in. Or in front of the power outlets, for that matter. Do you camp out under the phone booth while you’re waiting to use the phone? Are you old enough to remember what a phone booth is? Even if you’re not, the answer is "no." Looming over people doesn't make their phones charge any faster. And if you are one of the people standing, try not to face the people at the station; you don't want them to feel like Herman Munster is listening to their calls or reading their email. You can charge pretty much any device to a usable point in 60 minutes. Any more than that, and you’re just saving the battery so you can enjoy a bootleg of Batman vs. Superman while everyone else on your plane is stuck watching overhead reruns of Parks and Recreation. Because they spill. Kinda like you don’t put a TV by the bathtub. Only in this case, your stupidity endangers more than just yourself. 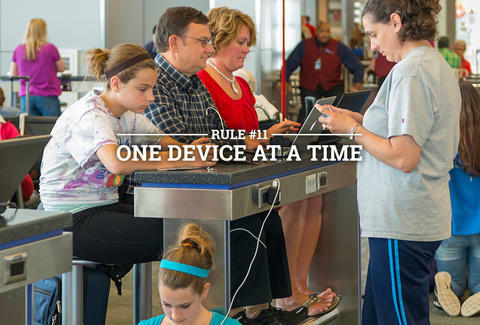 Because you’re going to be too worn out to corral them, and in their furious excitement over being in an actual, real-live airport, they’re probably going to snag a charging cord and send someone’s computer crashing to the ground. And “sowee” (you know, sorry) isn’t fixing a $2,000 laptop. Some people other than gate agents need to do actual work in the gate area. Others like to shop for matching “I Love Milwaukee” trucker hats. It doesn’t really matter what the people who need the charging station are doing, but they rank ahead of someone who just wants a nice view of the tarmac. Even if you DID grow up an only child, there are times in life when you need to share. This is one of them. Next time, maybe bring a book. Or a Kindle; apparently they have an excellent battery life. It’s like walking up to someone at McDonald’s and just grabbing a French fry. Awkward, rude, and actually kinda gross. Though your new lady friend probably is extremely concerned that you’ve been forced to spend an extra hour in the boarding area, you’ll see her soon enough. Let the phone charge, then argue about who has to hang up first. Doing this trumps any breach of the rules above, because if they’re too stupid to be courteous, don’t make yourself look stupid too. You may, however, casually stand next to them and read this article aloud.